Today marks two years since Ben left this world. I don’t know if it feels like a longer or shorter time. I guess both, depending on what moment I’m in. I’ve spent the past few days thinking about what to write and how I’m feeling. These are hard days filled with tears that flow easily. In my mind, it’s perfectly okay to have a few sad days. In a way, the tears are reminders that I was fortunate enough to have had a beautiful love that I miss so profoundly. But, it’s sad nonetheless. A year ago, I posted this video, and I am posting it again because I love these memories of Ben and I love people to remember him alive and vibrant. He loved those photos, too. And, “In My Life” was his favorite Beatles song. It was played for him by a lovely guitarist named Todd on the day he left. I know for sure that Ben has not left me. 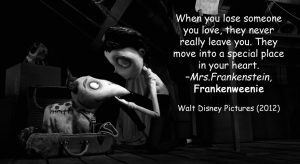 As Mrs. Frankenstein says, he has moved into a special place in my heart. I often feel him with me. I still talk to him. That does not make sense to everyone and that’s okay. It seems to me that the best thing that I can do is try to honor him in my actions. Sometimes I buy things, listen to music or watch movies because they let me get lost in thoughts of him, and in those moments I see him smiling. Sometimes this gives me comfort and at other times it is a painful reminder that he is not here. Sometimes I do need a good cry. In facing this second anniversary, I took time to reflect on the past year and where I am compared to last year. Firsts are hard, and in that first year without him, every first occasion hurt in a very raw way. I labored through that first year, often just going through motions. Although I slowly ventured out and saw friends and participated in activities, I often returned home in tears because it took so much energy to act cheerful, and if I was at all enjoying myself, I felt guilty and overwhelmed, or almost confused by, the conflicting emotions. Blogging helped me find purpose and revisiting the Disney films I love so much helped me to focus, as I looked for messages and guidance and opportunities to gain insight into my experiences. The fact was that although my dad died a year and a half before Ben, since I was so busy as Ben’s caregiver, I did not have the time to really grieve that loss. When I lost Ben and I no longer had caregiving responsibilities, I was able to truly grieve, but it was for the loss of both of them. It was also the loss of what had become my definition of myself as a caregiver. In this second year, I still profoundly felt Ben’s absence, and yet, I have found that he is always present. I had to establish a new normal. I would say that this year was spent integrating my caregiving experiences and grief with rediscovering myself and redefining my life. I have made changes, particularly to my apartment, and I’ve documented those in this blog. The changes have not come easy, but Ben has been a part of the choices I’ve made. And, there are some things that I cannot let go, which was why I got so upset when his computer crashed and insisted on restoring his music library on his desktop computer with his speaker, and why I have continued to use his desk chair/wheelchair although it is not in great shape and I have new and beautiful Mickey Mouse chairs that he would love. I admit that I dreaded this day and have been very emotional even thinking about this blog post. In general, although I have not forgotten the scary and devastating times, I prefer to summon the fun and loving ones. Unfortunately, summer, and these few days in particular, are spent reliving Ben’s last days, with hospital and hospice memories. There was a lot of love, but there was ultimately loss. I can’t seem to stop replaying the scenes in my mind. I’m trying to embrace the sadness as part of the process of grieving and as a quiet time to think about Ben and about us, and how much I miss him. I give myself permission to be emotional. Last week, I did have a wonderful distraction, traveling to Chicago and visiting my dear college friend, Monica, whom I hadn’t seen in many years. She named one of her daughters Abby and I’d never met my adorable namesake, her adorable sister, Andi, or even her husband, Mike. Caregiving certainly kept me from going anywhere, but I’d lost touch with so many people I cared about. Catching up with Monica and meeting her family was a most special time and the happiest I’ve been in a long time. Spending time with good friends, being with kids, laughing and exploring are fun and treasured moments for me. Monica wanted to know about Ben, and it felt good and important to talk about him and our relationship in the good times and the bad times. Ben knew how important my friends were to me, and he would have loved Monica’s family and seeing me with them. 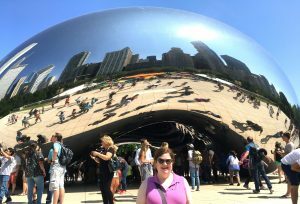 He also would have enjoyed Chicago, and although it was sad that he was not actually there, I delighted in the Shedd Aquarium and the architecture, and especially The Bean, through his eyes. Yes, it brought some tears, but it also brought comfort. I can keep living and honor and carry Ben with me all the time. The Bean sculpture in Millennium Park. It was probably the most sentimental place we visited, since Ben’s nickname was Mr. Bean. 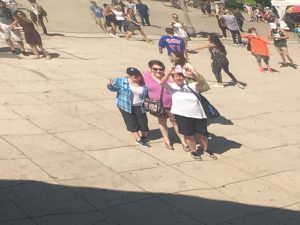 Abby 2.0, my namesake, Monica and I taking our picture off of the reflection from The Bean! 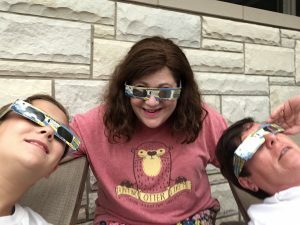 Watching the historic solar eclipse with Andi and Monica. Ben, the science and documentary lover, would have relished this moment. I learned a lot about myself over the past year. In Walt Disney Pictures’ Alice in Wonderland, Alice said, “I can’t go back to yesterday, because I was a different person then.” Caregiving and watching Ben battle ALS changed me. I felt and expressed love and compassion in such deep and immeasurable ways. I came to recognize a strength and bravery in myself that I still have trouble acknowledging, but I do know they are there. I found myself in caregiving and I want to support other caregivers whenever possible. I’m redefining my life with things that make me feel happy, satisfied and useful. I am not quite there, and I have my setbacks, but I am on my way, and I know that Ben is with me on my journey. I don’t know what the next year will bring. I do know that I will take Ben with me in that special place in my heart. I’m thinking of you today, my dear and silly Ben, as I do every day, free from the constraints of ALS and walking, talking, eating and playing your music. I love you. 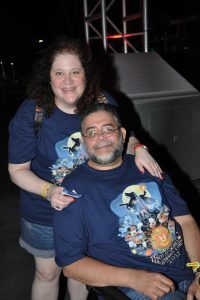 Ben and I at Walt Disney World, Halloween 2011. Good memories are always a comfort. Bambi’s Story Rings True After 75 Years! Today marks the 75th anniversary of the release of Walt Disney Pictures Bambi. It is a special film to me, and has become even more special during my experiences in caregiving and grief. Comes each day like the dawn. I wrote another post about the wonderful relationship between Bambi and Thumper. The following most delightful scene took on a new meaning for me. Thumper was the very adorable and lovable young forest gossip, and he certainly didn’t always say the right thing. He was the one to point out that Bambi was “kinda wobbly, isn’t he?” and “he doesn’t walk very good, does he?” This is not exactly the positive reinforcement someone wants when struggling and self-conscious! And while his mother had to remind him that “if you can’t say something nice, don’t say nothin’ at all,” Thumper was a child making an observation, albeit tactlessly, but his heart was in the right place. He was quite devoted to his new friend, the young prince Bambi. Thumper and his siblings (also incredibly adorable little bunnies) play with Bambi but also watch out for him. They anticipate where he is going to struggle and they gather around to help him so they can play together. Thumper was Bambi’s motivation. I especially love this clip, in which Thumper assesses the situation on the ice and tries to position Bambi’s legs, advising Bambi to “walk both ends at the same time.” It doesn’t go so well and they both end up skidding and falling. It reminded me of the way I had to work with Ben to help him up and figure out the best way to get around. We each had to trust each other and there were times we were nervous and other times it was fun. There were times that I managed to keep him from falling and got him safely onto the bed or a chair. There were also the times that we both ended up on the ground, fortunately unharmed. And, like Thumper, we often found ourselves saying, “Gee whiz, what happened that time?” I always loved this scene in the film, but now I see it in a new light. Thumper never gave up on Bambi or their friendship in the same way that as caregivers, we never give up on our loved ones. And, Thumper was so happy when Bambi did have an accomplishment like walking steadily. Though Bambi is first learning to navigate the world and Ben was adapting to new ways to do some tasks and dealing with losing the ability to do others, I could relate to Thumper’s positive attitude of problem solving and encouragement. Also touching was that he never left Bambi behind in pursuit of his own fun. ALS is known to be an isolating disease, particularly because you lose the ability to communicate. Thumper was determined to have Bambi join him with their other forest friends. It is an important lesson for all caregivers, friends, relatives and others to find some way to remain engaged with our loved ones. Visits, cards, texts, emails, photos, videos and a simple presence can all help a person feel remembered and included in life. Ben and my dad always enjoyed hearing that people thought of them. Bambi was so frightened, confused and sad to lose his mom. He did not know what the future and the world held in store. But, time went on and winter turned to spring, and Bambi grew up. He reunited with Thumper and Flower and the rest of his friends and all their families, and none of them forgot the friendship they shared. 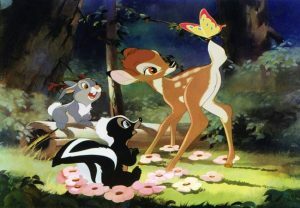 Thumper and Bambi- and a dose of Disney- remind us that love never dies and beautiful memories stay strong and sustain us as we move through life’s good and bad times. Happy Anniversary, Bambi. And, thank you! Today the world lost Barbara Cook, a legendary Broadway performer and one of my favorites. I have always been starstruck, but I am always hit kind of hard by the loss of these people whom I never really knew but whom I admired and whose talents gave me so much joy. At 89, she only recently retired. I was fortunate to see her perform many times over the years. I wish I had seen her in “She Loves Me,” since it is one of my very favorite shows, but I am grateful for original cast recordings so I can listen to her. 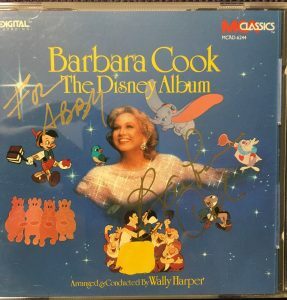 Many years ago, Ms. Cook did a CD signing at Lincoln Center. I was so excited to actually meet her. I brought all of the CDs I had of hers and she was very gracious. She smiled so brightly when she saw “The Disney Album.” She said she hadn’t seen it in years. I explained that I played the cassette so often that it broke, and it was hard to find the CD! She asked what my favorite song was and I really couldn’t pick just one, but I asked if she had a favorite. She said it was hard for her to pick, too, but she thought it was probably, “When I See an Elephant Fly.” I always think of her when I hear that song. I was grateful to have had that sweet exchange, and to see the sparkle in her eye from that seeing the album. Rest in peace, Barbara Cook. In my mind, you will definitely be leading a chorus of angels. Thinking about that signing also conjures another dear memory. My aunt Eleanor took me to book signings when I was young, and I was always thrilled to meet famous and wildly talented people. I always think of my aunt as I continue what has become one of my favorite activities. When Eleanor’s Alzheimer’s advanced and she could no longer accompany me, I got books signed for her. We looked at the books together, which she enjoyed despite the changes in her memory, and I enjoyed because it let me step back in time and relate to her in a way that transcended the Alzheimer’s. I am tremendously proud of my collection of signed books and CDs, and proud to honor the relationship that I have maintained with my aunt. 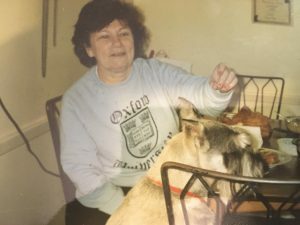 Aunt Eleanor with our Standard Schnauzer, Dulcie. Ellie was never a huge dog lover until she met Dulcie. 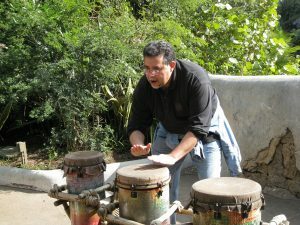 Ben playing the drums at Walt Disney World’s Animal Kingdom. He loved listening to and making music. In a post last week, I wrote, “I’m learning to be here in this world with the knowledge that Ben is a part of everything I do- as are my mom and dad- and they will never leave me. I am creating a new way of relating to them and they are here, without physically being here, evermore.” I’ve also written a lot about things that matter because they represent Ben and our memories. It has been so difficult to even consider parting with things that he loved, that he frequently used, or that were important to us. I’ve written about his table breaking and needing to be replaced. In that case, I never liked that table and until faced with how substantial a part of Ben’s life it was, I would not have imagined it to be something that mattered. Then, there is his shabby desk chair that became his makeshift wheelchair, filled with some lousy memories, but which is still the chair that I choose to sit in, despite my new and lovely Mickey Mouse chairs. Yes, they are things, but they give me a sense of peace and security. I feel Ben when I am surrounded by these things, even though I also know that he is in my heart evermore. A few days ago, Ben’s desktop computer crashed. This was something I dreaded because Ben’s computer was his lifeline. Almost every single day, I would get him dressed and wheel his chair out of the bedroom to his desk and computer. He used the computer all day–paid bills, watched movies, texted, surfed, and, most memorably, listened to music. I especially loved to arrive home and see him with his cute little smirk, singing along to our Disney soundtracks, recounting our visits to Walt Disney World. Ben’s face lit up when he listened to music and he loved to talk about music and orchestrations. Without wanting to resort to many clichés, music was essential to his being. 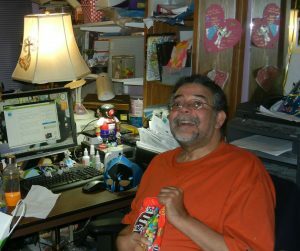 During his last weeks, I came home from the hospital each night and turned on his computer just to listen to his playlists. It kept him close and present in our apartment, where I felt very alone as I grappled with the knowledge that he would never return home. I have continued to use his computer, almost exclusively to play his music. Since music was so important to him, it has kept his spirit vibrant to have his music fill the rooms. When suddenly his computer would not boot, I went into a complete panic. I tried to remember things he taught me about working with computers, but nothing resolved the issue. I was completely devastated at the thought of losing Ben’s music and not being able to play it on his very own computer. The fact that this happened in August, with the quickly approaching second anniversary of his “leaving,” amplified my emotions. I remembered the many times that he set up a video and music for me as a surprise for my birthday, Valentine’s Day or our anniversary. I remembered the song lyrics he gave me over the years to express his thoughts about our relationship and love. 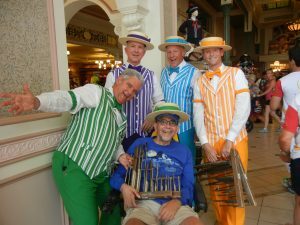 Even at Walt Disney World, he loved the barbershop quartet, the Dapper Dans, and the live bands that performed at the England Pavilion of Epcot, especially when they played The Beatles. Of course, I had some of the same music in my library and I could get any music, but I wanted things to be the way he had them, with the sounds of the iTunes playlists on his computer coming from his speaker. I tried to listen to music from my laptop and iPhone with a different speaker but it was too unsettling. These are the setbacks that bring back all the pain, just when I think I’m beginning to manage things pretty well. In addition to the potential loss of his music library, I was also upset about possibly losing the inventory data for Pets en Voyage, my pet travel souvenir business, though I was pretty sure there were back-ups. Ben had painstakingly set up the inventory for me, and he was masterful with this kind of thing. He was so proud of what he had done, and of my business, and the data was invaluable not just for the information but for the memories it held of something that we worked on together and that gave us joy and hope. Although I had to put the business aside when caregiving responsibilities became overwhelming, planning and designing when I had a few minutes here and there, or even brainstorming in my head, kept my mind active and gave me some sort of focus for positive thoughts of the future, which generally seemed very bleak. Using Quickbooks to utilize the information has kept Ben a part of my activities and that has been such a comfort and inspiration to get back on track. I could not imagine losing that. Ordinarily, Ben would have been able to troubleshoot and solve his own computer problems. He did teach me many things, but I was unequipped to deal with a hard drive failure. It felt like another loss. As much as I did not want to ask someone to take on tasks that were integral to who Ben was, I also wanted to preserve those things that were Ben. So, yesterday, I hired a computer tech consultant, Carlos. It felt very strange and sad, and yet, I think Ben would have enjoyed working with him. He was fantastic, and although the hard drive was corrupted, thankfully, he was able to recover the data. He made a couple of copies of Ben’s music library, and I will also upload it to the cloud. Although he suggested putting the music library on one of my laptops, I asked him to set up a desktop computer that Ben had purchased but had never used. Carlos understood that although I did have to change the computer itself, emotionally, I needed it to still be Ben’s, with the identical files and structure, and the same monitor and speaker. Thanks to Carlos, Ben’s music will still play as it always did, with the sounds still coming from his speaker. The first music I played on the restored system was The Beatles’ “Love Songs” album, as it should be. As I have written, I have been ready to make some changes in my apartment, but definitely not this one. I’ve written about what we know from Bambi, that “Love is a Song That Never Ends,” and, thankfully, it will sound just right, as I continue to sit in his chair, peruse his playlists, smile as I remember his love of music and know that I have honored him and our life here. Here is a tiny video that I took during our last trip to Walt Disney World, with Ben watching the live band at Epcot’s England Pavilion. He was so happy to listen to live bands and I wanted to capture the memory and he didn’t want me to miss the music!